Ready to nerd out? How about this phrase, “Accountability is Binary”? 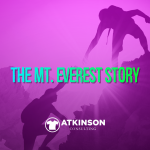 I was speaking with a coaching client a few weeks ago about a few employee challenges they were facing. During the conversation, our dialog path focused on the fact that employees either do their tasks correctly, or they don’t. What I’m referring to here is binary code, where the programming is expressed in either a 1 or a 0. It’s not much of a leap from that to saying that things are either right or they are wrong. You either did the task correctly or you didn’t. In shops, owners and managers spend an inordinate amount of time discussing certain staff members who simply are not pulling their weight. How much time do you spend talking about the same people, over and over again? Frankly, it’s what keeps some folks up at night. Customer service or sales reps that can’t quote things correctly? Orders that are entered with missing or erroneous information? Purchasing that buys the wrong color, sizes, or SKU? Receiving that misplaces inventory that comes in? Art department that has to redo art files because they “forgot something” or need to tweak a color plate? A screen room that when out of one screen mesh frame will simply substitute any mesh count? Why won’t that 305 work for an underbase? Embroidery digitizing that doesn’t take into consideration the shirt fabric when preparing the file? Digital print pretreat that is uneven or unpredictable? Shirts that are loaded crooked or off-center. Embroidery trimmers that cut holes while trimming multiple times a week. Hangtags that aren’t in the seam or neck label, but instead make a hole in the shirt? Ink colors that are mixed that are “close enough” to the Pantone color, but don’t match? Your screen-print dryer temp for the last week has been about 230 degrees and nobody said anything? The production schedule has 33 orders that are late, but there isn’t a plan to catch up? Shipping put the wrong shipping labels on different boxes, so customers are receiving someone else’s orders? Accounting hasn’t invoiced any orders in six days because they are “too busy”? Even the bathroom makes a highway gas station facilities look clean? Stuff like this is enough to drive you to drink. Or, at least reach for the Tylenol. These are common problems in shops. And, that’s not even a complete list. I’m sure your column of misery could include a few more. But the question hanging out there regarding accountability is what do to about it. It might feel like herding cats, but there is a solution. Let’s call it the 4 Step Plan for Accountability. The best way to get everyone on the same page starts by detailing the processes in your shop so that there is only one way to do something. You have to simplify things. Let’s take the first challenge on my list above, “quoting things correctly” and work out a process. 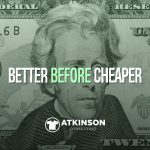 If you have the quoting process built correctly, anyone in your shop should be able to quote a job…no matter how complicated…and arrive at the same price as everyone else. Immediately. 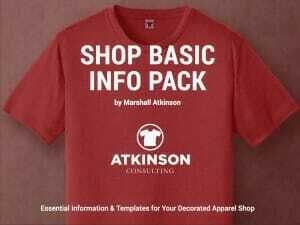 Using the shop quote form or computer system, the CSR or Salesperson obtains all of the pertinent information for the quote. Immediately does not mean do it tomorrow. This quote is built using the shop’s internal system and pricing guidelines. Garment availability is checked with the shop’s suppliers. The number of screens needed, stitch counts and other job parameters are verified by actually doing that work. Order ship dates are checked against the system for production schedule availability. Before anything is sent to the customer, a Sales Quote Checklist is used to ensure that the quote is in alignment with the customer’s information and needs. This includes verifying that the math is correct, and everything is spelled correctly. Using a process and checklist approach ensures that deadlines can be met without overtime, that rework is eliminated, and that ultimately the customer will be satisfied with working with the shop. The number one goal is always happy customers. Anything that gets in the way of that is a problem. Every time a quote is needed the same process is followed. It’s the “Shop Way” of quoting. This allows more employees to be trained and maximum accountability, as everyone is held to the same standard. The information for building the quote is accessible by anyone that needs to do this work. Everyone uses the same process and follows the same steps. The person quoting is responsible for their orders. They are responsible for following up with their quotes in a timely manner to speed order conversion. A Sales Manager is in charge of the process and holds all staff accountable for doing it the right way. When you build a process like this and standardize it for all employees it makes it much simpler to do the right thing. However, there may be a bump in the road with this somewhere down the line. That’s ok. Nothing is written in stone. Tweak your process so it works properly. When you add automation, software, a new decoration department, or any different idea to the mix you will need to build out the process. A great visual to use for this is a simple flowchart. List each step and illustrate what the next one should be in the process. Step 1 is this, step 2 is this and so on. Remember, the above accountability process is only an example. A similar process could be built for Receiving, reclaiming screens, shipping to Canada, or printing a packing slip. Wherever you are having a challenge, define your “Shop Way” of doing it. Handle this by making it easy for people to do the right thing. This is handled differently around the shop by department. The number one expectation is pleasing the customer. They should be empowered to do that. Fast, friendly, and accurate service. Sales and CSR staff answer all questions and respond to customer’s questions as quickly as possible. Even if more research is needed, the staff is expected to follow up and let the customer know that you are still working on the problem. The “Sunshine Law” is in effect, which states that all customers will be responded to before the sunset, if not sooner. As a good number of art or production challenges are due to missing or inaccurate information, it is the Sales and CSR’s responsibility is to ensure other departments have everything they need to do the job correctly, accurately and as quickly as possible. If anyone ever comes up front and asks, “Hey, what’s this mean?”, it means that the order instructions were not clear enough. If all tasks have been handled, the staff is expected to contact customers that haven’t ordered lately and see if we can help them. Sales and CSR’s are 100% responsible for managing all aspects of their orders in the system, from start to finish. If an order is delayed for any reason, the expectation is that they will move the ship date out to an appropriate date. They “own” their orders, and if any challenges arise they should resolve them promptly. Receiving Your Receiving team is vital to the success of your shop. When UPS drops off a load of boxes, they are not cartons of shirts. They are boxes of money. There is a financial risk you are taking for every job in your system. For each shirt that is unaccounted for, missing, or the wrong style or color, that could end up costing you money. Receiving’s number one job is to prevent financial disaster. But, there is a problem. The clock is ticking. The clock being that Production needs to start on that job soon. This is why the mandatory expectation for Receiving is that any shirts coming in today, must be counted today. There is a proper way to do this too. First, the packing slip that is attached to the box is used and the contents of the box are checked against it. What you are doing is verifying what is in the carton. Does it match? The slip is initialed and dated by the person counting so that everyone knows who verified the contents. Then, the packing list is checked against the system to ascertain if it matches to the order. Received complete? It is marked in the system as complete. A box label is printed and adhered to the upper left-hand corner of the short side of the box. This has the work order number, ship date, order name and client’s name on it. The box is then staged in the production inventory area by the last digit of the work order number. Partial? It is marked in the system as partial and noted what is missing. A box label is printed and adhered to the upper left-hand corner of the short side of the box. Using a fat black marker a big “P” for partial is written on this label. This also has the work order number, ship date, order name and client’s name on it. The box is then staged in the receiving partial inventory area by the last digit of the work order number. When the remaining inventory comes in, this is added to the box so the inventory is complete. It’s marked in the system and a new label is printed and adhered over the existing one with the “P”. Then, the box is staged in the production inventory area by the last digit of the work order number. I’m lumping the art department in with embroidery digitizing too. There is a trend in this industry that is growing to outsource a chunk or even all of these creative tasks. Whether you still have it in-house, or your shop relies on a partner team somewhere else, there still are some expectations and guidelines to follow. Accountability starts with clear expectations here. The first one is that before any creative work is to start, the instructions and parameters of the job are fully read and need to be comprehended. If there are any questions, concerns, or missing information, the art team is expected to speak up before any work begins. Hopefully, the instructions are clear and concise, but that doesn’t mean that mistakes won’t be made. Every time your creative team has to make a change, that costs you time and money. The expectation that you should set is that 85% or more of your art gets approved first time out. Which means you should be tracking this. Make note of the reasons why you don’t get approved initially, and if there is any way you can build the process to resolve that for next time…do it. Your art crew is expected to have fantastically designed and amazing work on a constant basis. That’s their job. But, that doesn’t mean that they can steal other people’s ideas and pass them off as their own. Be inspired, yes. Five-fingered intellectual discount, no way. Another expectation is that your creative team knows where the spellcheck button is on their programs. This has to be used whenever there is any type in the design. There is no excuse for misspelled words, and your art team is responsible for preventing this. Yes, even with customer supplied art. Their job is to safeguard your shop. Again, more accountability. Finally, your art crew has to be technically proficient. When your artist comes out to the floor for a press check and wants to tweak some curves on the blue plate because they don’t like the gradient in an area of the file, that costs you a significant amount of money in lost production. So, when they forget to choke the underbase or don’t preflight the customer supplied art and a word or section of the file is missing…those on press problems become extremely expensive. One word here to remember: Training. Regardless of the decoration method, orders have to be produced. The most important piece of information for an order is the ship date. For production, this means scheduling the work so it is complete one business day before the job is supposed to leave the building. The expectation is that Production will do what it takes to ensure that this is a reality. That often is difficult for a myriad of reasons. But still, that has to be the expectation. The absolute best way to handle this is by looking ahead proactively and preparing the work for the production crews. Each workgroup needs a daily schedule prepared and printed the day before on what they will be working on. For example, if you have four automatic presses and two manuals, each press will get their own written schedule printed the day before. The jobs should be listed in the sequence that they need to be completed. A good rule of thumb to use is Rush, Late, Today, Tomorow. Before your Production manager leaves today, every job for each workgroup needs to be pulled and staged for tomorrow. With that sequence in mind. Jobs are lined up neatly. For Screen-printing, all shirts, screens, inks, samples, and documents are staged this way. In Embroidery, it is the same but you should pull the cones of thread. This works the same for DTG, Heat Press or Dye Sublimation workgroups too. The expectation is that each workgroup will produce what they are given before they leave for the day. The more understanding you have of your production team’s daily capacity and velocity, the better you will be at scheduling work for them. This takes practice and lots of metrics. Another mandatory expectation for Production is that all jobs will be produced with the highest quality possible. This means that PMS colors should match regardless of the shirt color or if the image uses an underbase. The decoration should not be off-center or crooked. Embroidery work should be neat and clean with excess threads and stabilizer trimmed. Hoop marks should be steamed out. When your customer opens the box angels should sing the song of perfection. I’m including this here, as often there are steps that need to happen before that order ships. Do you apply custom heat-applied or pad-printed neck labels? Hangtags? Maybe you polybag orders or bundle items before putting them in boxes. Chances are these areas might be a headache for your shop too. Mostly because they are treated as an after-thought instead of the revenue generating departments that they should be. Anything you do after the shirts are decorated, but before the job ships should be considered a post-production step. Are you allowing enough time for that process to occur? That’s usually the biggest problem. Just like with a decoration production schedule, you need to understand the time, resources and labor needed to get these order tasks completed. Will the steps take an hour? A full business day? Do you have the neck labels, hangtags, or other items needed already? Similar to production scheduling, stage things the same way. Prepare a schedule today for what is needed tomorrow. This means you should have completely decorated goods available today, for anything that needs to be routed through the post-production steps tomorrow. That takes planning and communication. Let’s pretend that your offense got the ball with 0:27 seconds left in the game and just drove 87-yards down the field. Suddenly, on the next play going into the end-zone your running back fumbles the ball on the 1-yard line. The other team recovers the ball. That’s what it is like if every department in your shop handles their tasks perfectly, but the shipping department doesn’t get that order out on the right day. You just fumbled the ball. All that great work and effort doesn’t matter. Which is why you need a fantastic team in Shipping. Their expectation is simple. Jobs have to go out on time, with the right shipping method, to the correct address. For starters, this means that they have to rely on other departments to do their work correctly. Order entry has to have the right address information and ship method built into the job. Production and Post-Production have to complete their work early enough to for shipping to wade through, sort and ship everything correctly. Like other departments, they need time and organization to do this properly. Start by pulling a schedule first thing in the morning of everything that has to ship today. How many of those jobs are already complete and are waiting to be processed? But if not, Shipping needs to communicate with each department and find out where and when they will be getting the orders that have to go. This proactive check and balance work will help you score that touchdown. Problems should be addressed early, not at 3:42 in the afternoon. If your shop is not receiving 100% of the money for an order before you start working on something, then you need to be invoicing your customers as fast as possible. Yet, some shop only invoice one day a week! When an order is complete and shipped, you should be invoicing your customer the following business day at a minimum. There should be no waiting. I know shops that invoice on the same day that the job is shipped. Why is this important? It’s simple. That’s when the clock starts ticking for your net-30 or whatever you have agreed to with your customer. If you wait a few days to invoice, you just strangled your cash flow for your shop a little bit. 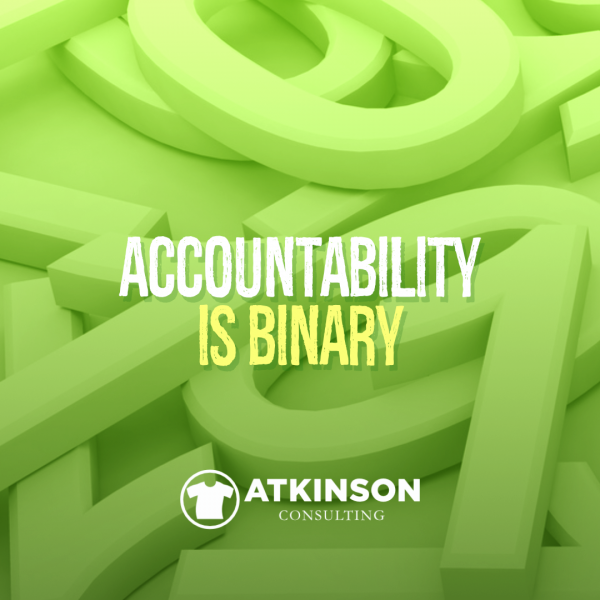 Instead, make a mandatory rule that builds accountability with your accounting team. Any job that ships yesterday is invoiced today. Another good one is any customer that is past 45 days on receivables is on credit hold and can’t place another order until they are paid in full. Better, of course, is to get all of your money up-front before you start work, but if you are extending terms make sure you set rules in place to protect your company. Here’s where the rubber meets the road so to speak. If you want more accountability with your staff it is crucial that everyone is trained the same way. It doesn’t matter what your expectations are if Billy does something one way, and Maria does it another. Get your Standard Operating Procedures (SOP’s) together and train both Billy and Maria to handle that task the same way. When you train your staff on what they need to constantly deliver, you are setting the tone for what needs to happen…but you are also giving your people the knowledge and skill they need to execute it correctly. Training can be a fully built out education course, or simply just showing someone where to click something in a program. Don’t assume people know how to do anything. Help me understand is a powerful phrase as it seeks to understand the situation, correct the problem, and implement training all at once. If you have built steps one through three, step four is going to have you hold people’s feet to the fire. Remember, accountability is binary. Either they are doing it right or it’s wrong. This doesn’t mean you have to be a jerk. It means that you need to hold your staff to a higher standard and there should be a sequence of events that are triggered when something doesn’t go according to plan. Information – it is either wrong or missing. What led to the problem occurring and how could the right information prevent it from happening? Time – usually there isn’t enough of it. What would happen if you started earlier or delegated the task out to someone? Training – did they really know how to do the task completely? Take a minute to show them how even if you did so yesterday. Be patient! Equipment – is that machine or computer working the way it should? Get that sucker fixed. Experience – people don’t know what they don’t know. See training. Distractions – what is getting in the way of the focus that is needed to do the job correctly? Eliminate that distraction. Apathy – some people just don’t care. Why are they on your team? Therefore, think through this and develop a better plan to ask more questions and hold your staff accountable for their actions. What you want to build are the steps that happen when something isn’t quite right. Remember, managing your crew is less about ticking checkboxes regarding their attendance and more about elevating their performance through human interaction. What can you do to make them better or solve a problem they are having? If you need help holding your team accountable in your shop, this $49 eBook was written just for you. In the eBook, you’ll find easy to use templates for a customer Business Plan for your shop. There is a section on Branding. Plus, for accountability, there is an easy to use Employee Handbook template. The best feature though is the Production Log Dashboard system, so you can track your progress on the mountain. Click here and buy this $49 eBook today!